Shazmina Bendi's close encounters of the crafting kind! Apologies for my extended absence, it was waaaaaay longer than I intended. But here I am, just quickly, to show you some recent purchases (got to love payday!). I was in a bit of a " I HAVE TO HAVE IT NOW!" mood on Friday, here are the results. This arrived yesterday. 4ply Merino in Earth colourway from here. 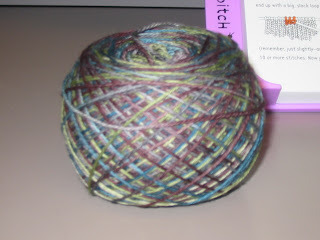 I have lusted for this for a while not sure if it will be socks or a shawl, I will keep you posted. After seeing Nora's fabulous seasilk clapotis on BDK and getting to fondle the seasilk in person (thanks BP! ), I just had to have it as well. Genius pairing of the seasilk and clap pattern by Nora, cant wait to get started! 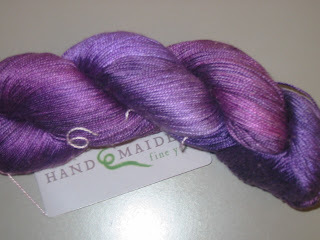 Handmaiden yarns can be founde here. So that is my very quick update, I have some FO's to post about (including pictures), and promise to do it soon! ps dont worry my Craft AADC status is not about to be revoked anytime soon, I have 6 projects on the go at the moment! Yarnilicious indeed. They look very tastey. Yay for posting pics of finsihed objects soon. I know I will love socks, I already want to make a pair of Milicent's. AND on the weekend I was looking at Birkenstocks and wondering if I should buy a pair I can wear socks with...... Oh yes, I am a Nanna! Sock time is coming soon!! Looking for an Enabler, Applications now open! Things I Heart about Y'all!